For my 21st birthday, John gave me a baby blue beach cruiser much like this one. When I first saw this image, captured by Elizabeth Messina, I thought, "That could be John and I in his linen suit!" 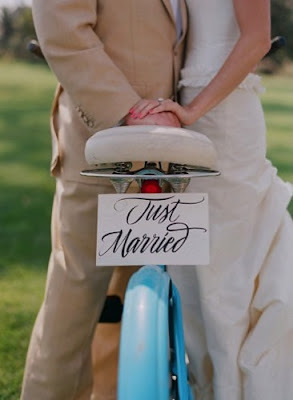 Ruffles at the hip aside, I'm sure we'll find a way to incorporate bicycles into our big day. I love the idea of Save-the-Dates/engagement photos featuring our bicycles, like the charming scene in Wedding Crashers where Owen Wilson and Rachel McAdams go for a ride in scenic Maryland. It's cycle time as I type, with John clomping around in his cycling shoes!